If only NYPD could do something about placard abusers clogging the streets. Streets in the Financial District predate the automobile and are very narrow by today’s standards. Park cars on both sides and you’re likely to get a bottleneck that jams up surrounding blocks. 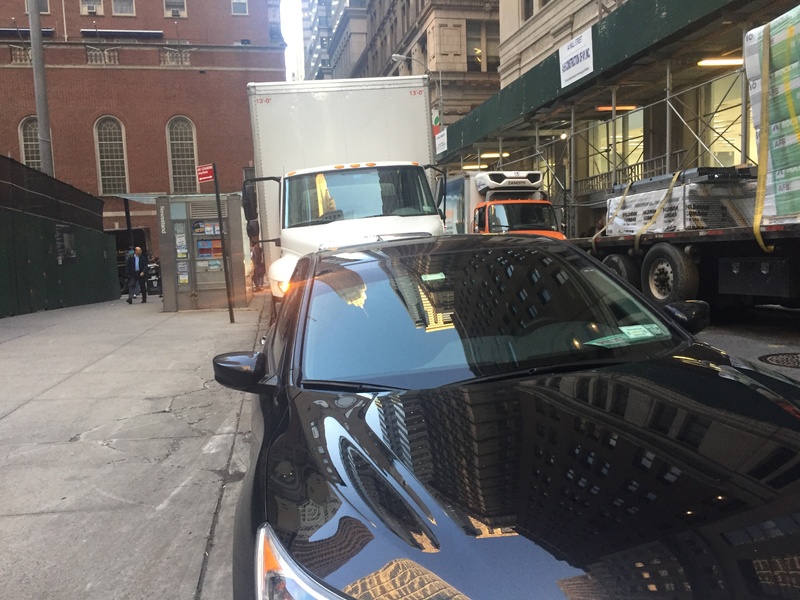 But tell that to the placard-holding Street Cheats who frequently take over both curbs on Pine Street between William and Nassau, causing headache-inducing scenes like the one captured on video by our tipster. Metered commercial parking lines the south side of Pine, and the north side is a no standing zone. Where there’s designated car-free curb space, however, there are bound to be placard abusers to fill it up. Placards also bring an unmanageable amount of traffic to downtown streets. A study by Bruce Schaller estimated that 19,200 vehicles are drawn into Manhattan by free placard parking every day. Letting placard holders park all over the place compounds the problem. Congestion pricing would help thin traffic in Lower Manhattan. And as our tipster suggests, so would a network of downtown streets that prioritize walking and limit motor vehicle traffic to deliveries. Watch in the video as police from the 1st Precinct get bogged down with everyone else. If only NYPD could do something about placard abusers clogging the streets. Tired of Street Cheats stealing public space where you are? Send your photos to tips@streetsblog.org, and follow along as we map NYC placard abuse. Where are the placard abusers? I see delivery trucks on both sides of the street and enough room for traffic to pass. It seems to me the problem highlighted in this video is impatient cops. The white box truck (not the Fresh Direct) is parked in a no standing zone (and also partially blocking the crosswalk). It cannot access the commercial loading parking because it has placards (in addition to loading vehicles). Pine Street would be a perfect candidate for pedestrianization. I don’t think any garage entrances front Pine Street. Deliveries should be allowed during overnight hours. Take it from someone who walks on that street every day – the Fresh Direct truck you see in the video is parked at the southwest corner of Pine and Nassau (on Pine) every single morning for hours. NYPD and DEP cars park nonstop along Horace Harding Expressway (no parking zone) near their buildings at Horace Harding and Junction Blvd. Dozens every day. The BID wants the city to convert streets to "shared space" with a central hub for truck deliveries.